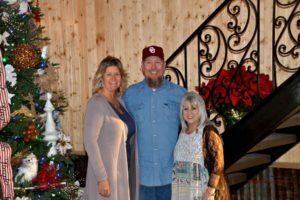 Charleston Sky owners Lisa and Kevin Carter joined by the venue’s manager Carol Lowery are officially open for business and ready to welcome the public to their event establishment, first of its kind in Delta County. The amenities are abundant at their location on FM 895 in Charleston, Texas. 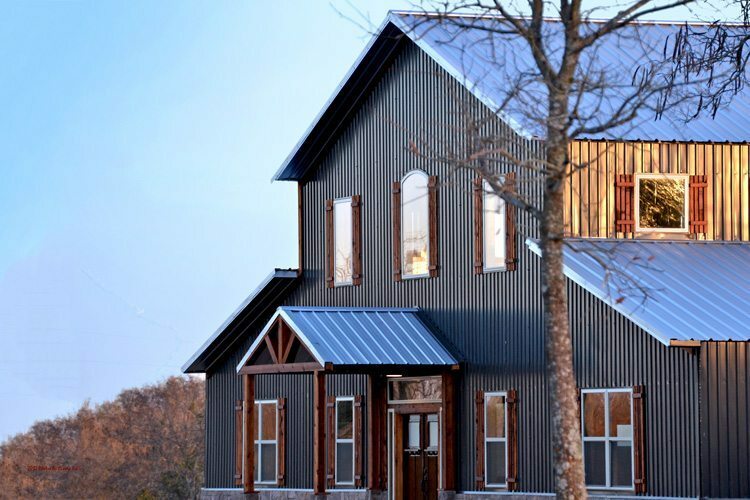 Lots of research and attention to details can be found from the unique faucet restroom light fixtures to the sliding barn doors to the etched curved details on the iron staircase railing. The venue is equipped to hold 250 guests. 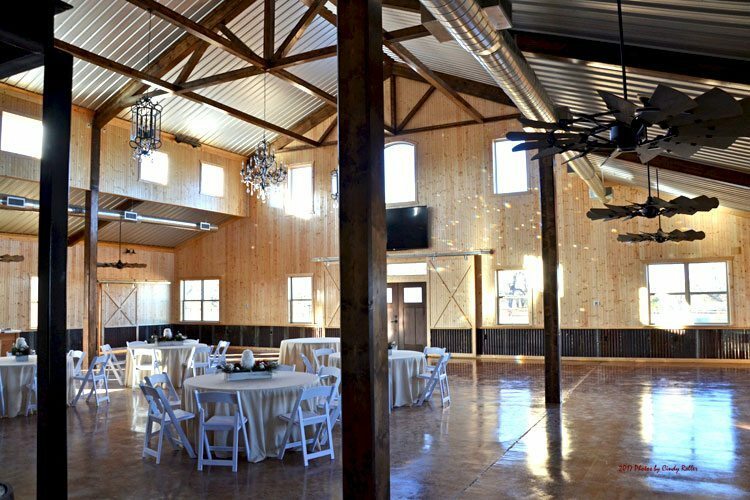 While it seems like a massive two-story barn from the outside the inside is a quaint ballroom with rustic wood and corrugated galvanized steel panel accents. Round tables with linens line the stained concrete floors. Unique up lighting highlights the wood-incased steel beam supports with beautiful hand-designed crystal chandeliers bouncing prisms of light giving it the perfect elegant feel. It is the first of its kind in Delta County. The Carters’ goal: “to think of everything” from a special catering room to a private entrance just for a bride to enter without being seen and three floor to ceiling “twirling” mirrors for photo opps. 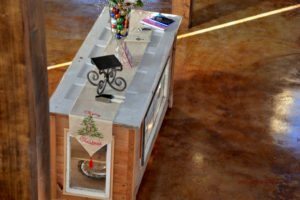 They have also included a groom’s cabin for entertaining. Speaking of photo opportunities they incorporated technology into the mix with an interactive photo booth which will sure to entertain guests. 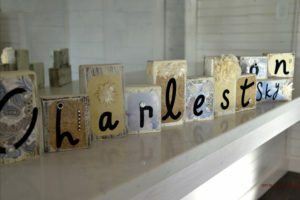 Something borrow, something blue, something old, and something new… fits the venue as they made sure to use shiplap from the original structure that stood on the land on Farm-to-Market 895 downtown Charleston. The wood, which dates back to 1924, was also used to create a mobile dessert bar. Helping manage the over 5,000 square foot barn-style venue and landscaped grounds will be Carol Lowery, owner of The Mill at Brew-la-la. Together they are ensuring the history of the area is preserved, collecting vintage photos of the old Nabors place and framing deeds from 1900s. The Nabors family has been very supportive of their vision right down to their windmill logo. More than just construction, the owners have been busy giving back to the Delta County community. They gave a generous donation to this year’s Cotton Harvest Festival and have made hiring local contractors a priority. On Saturday, Jan. 20 they will host their first big 2018 event as the annual Delta County Chamber of Commerce’s banquet will relocate to their venue. This will include a ribbon-cutting for the newest Chamber members – Charleston Sky. More of the wonderful pictures taken by Cindy are in our Gallery. Come see us – we are Open for Business!